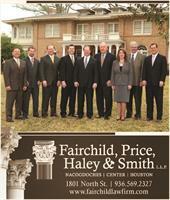 The attorneys of Fairchild, Price, Haley & Smith, L.L.P. are leaders in their fields, providing experienced, trusted council for their numerous clients across the country. Our firm is located next to McDonald's on North Street in Nacogdoches and is directly across from Stephen F. Austin State University.